Most people struggle to achieve fitness goals on their own. Without the proper education, it’s all too easy to develop an improper regiment that doesn’t live up to your expectations, leaving you feeling frustrated and discouraged. All Inclusive Health employs friendly, knowledgeable personal trainers in New Orleans that get results. Our trainers listen to your needs, whether you have a specific goal you’d like to reach or a limitation you want help overcoming. We establish practical, attainable milestones and teach you how to reach them. Not only that, but our trainers know how to keep you motivated. Unlike some personal training gyms, where trainers try to bully you into exercising, we make workouts fun with creative, individualized routines that get you excited about your personal training sessions. The skills you learn at All Inclusive Health last a lifetime, allowing you to continue your workouts well after training ends. 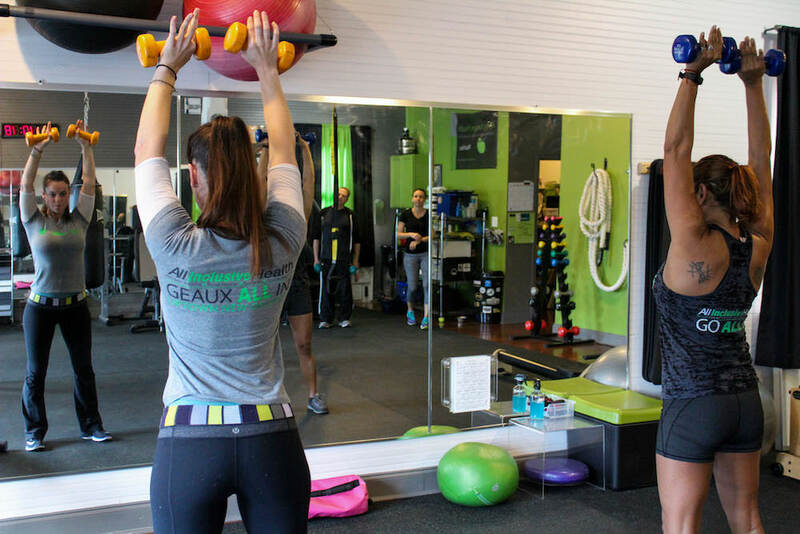 We have the best personal trainer in New Orleans for you, no matter where you are on your path to fitness. Everyone is different, so why try to use the same fitness training program? At All Inclusive Health, personal training sessions are individualized to fit each customer’s needs. From weight loss programs to strength training, endurance training, race training, and more, our personal training programs are customized based on your fitness level and goals. We are happy to take into account any physical limitations, health conditions, or disabilities our customers may have with our inclusive training programs. If you’ve been looking for a personal trainer, All Inclusive Health also offers online and independent training packages that enable you to take advantage of our personal training services anytime and anywhere that suits you. This initial assessment gives you a clear, comprehensive look at your fitness level. It’s an imperative first step that builds the foundation for your entire fitness training program. The assessment measures full body composition, cardiovascular endurance, muscular endurance, muscular strength, and flexibility. If you want to improve your fitness and live healthier, All Inclusive Health has the personal training studio for you. Personal training is your opportunity to receive a fitness training program that is tailored to your wellness level, fitness goals, and lifestyle. We provide a private location with a variety of equipment and capabilities that New Orleans customers need to succeed! The benefits of personal training programs are endless. Want to get fit and feel good? Our personal training center is the perfect place to start. Even if you’re already in great shape and exercise regularly, personal training sessions can bring you to your peak performance. Runners and sports players see the benefits of personal training in improved speeds, higher endurance, better muscular strength, and more. By consulting with our personal trainers in New Orleans, you can also avoid or overcome injuries. We teach you how to work out smarter, not harder. Are you ready to workout on your own and just need a program to follow? Ask about online and independent training packages! Get in Touch + Go All In!